Left and Write: I is for : I Spy!! I is for : I Spy!! 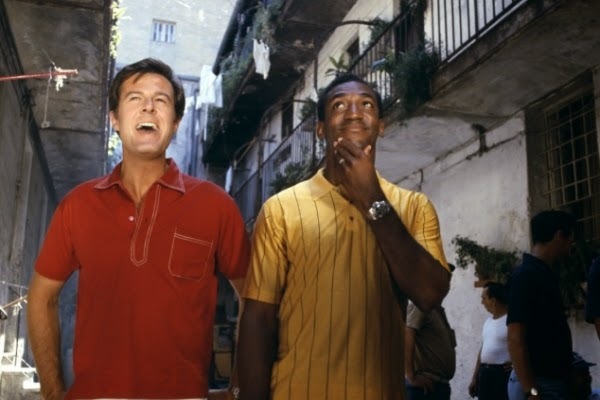 I Spy was a Cold War Era "spy" show starring Robert Culp (before his Greatest American Hero days) as secret agent Kelley Robinson and comedian Bill Cosby as his friend and partner, Alexander "Scotty" Scott. It ran on NBC from 1965 to 1968 and was one of my Grandma's absolute favorite show. The premise of the show was fairly simple. Tennis pro Kelley Robinson and his "coach" Alexander Scott traveled the world playing tennis.....or so the cover went. In reality, they were spies (hence the show's title) keeping the world safe from nefarious countries and all their schemes. Scott was the "brains" and Robinson was the "muscle", though I can't quite remember them ever mentioning the agency they worked for besides just the Pentagon. The show was a huge success due, much in part, to the craze of the genre back then and also the James Bond films. Of course a show like this wasn't without it's controversy. I Spy was the first show to feature an African American lead and it was actually banned in some areas of the South. Another part of it's success was the chemistry between Cosby and Culp and their hip banter during even the most dire of circumstances. First-time actor Bill Cosby won three consecutive Emmy Awards for Outstanding Lead Actor in a Drama Series in 1966, 1967 and 1968. Robert Culp was also nominated in the same category for all three seasons of I Spy. It's no exaggeration to call this a landmark television show. I loved the Cosby Show episode where Culp guest starred. I loved I Spy! What a duo they made. I never saw it, but my older brothers and sisters loved it. I remember that show. Three Emmys for Cosby? Impressive. Yup, I have fond memories of this show. I was only so-so about Culp but always enjoyed Cosby. I didn't know it was banned in parts of the South. That's so pathetic. I didn't see this one. I didn't know that this was Cosby's break-out show. Three Emmys... fantastic. I love a show when the dialogue is crisp and quippy and you can just tell that the actors are enjoying the heck out of one another. It's a real treat. Growing up in the South, I never saw I, Spy, but it's a show I have meant to get around to watching for a long time. Due to limited cable options, I never watched this show when it was on but I heard it was really good. Another one I watched on TNT (or a similar station)as a kid. Loved this one! Oh Man! I used to LOVE I Dream of Jeannie. Is it bad I've never heard of this show? I know all the other I shows you mentioned, if that's any consolation! Its crazy how young Bill Cosby looks. Would you believe I never saw this show? So cool!!! Bill Cosby rocks! My brothers and I used to play "I Spy" and "Get Smart." We were really into the secret agent thing. You're nailing it with all these shows! I loved "I Spy" !!! Bill Cosby, Eartha Kitt, Robert Culp!! Oh man, what great memories. Thank you! I remember this show but I would never have thought of it in a bazillion years. What fun that you are bringng them all back. Wow - I've NEVER heard of this show before. With Bill Cosby as a lead, that surprises me. It does sound very fun. 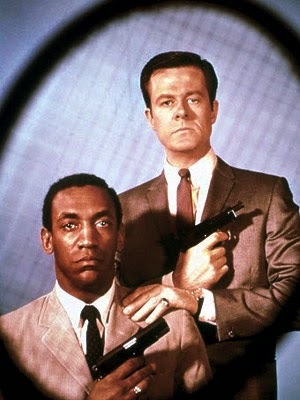 I absolutely LOVED I Spy and the chemistry between Culp and Cosby. I'm still a major Bill Cosby fan. I've seen him live and left with a stomach ache from laughing so hard. I loved I dream of Jeanie and It takes a thief. Great shows. Thank you for the stroll through time. I grew up on just about all those shows, to bad the world had to change.